In this exhibition I focus on the image of the flower. I come from several generations of garden lovers. My Grandfather had an incredible garden and used to win prizes in the shows with his blooms. Some of my earliest memories are picking flowers with my Grandmother in his garden. My Mother was for many years in the Horticultural Society, and as a small girl I used to exhibit in the shows my floral saucers. A bed of sand was put in the saucer, and into this concentric rings of tiny florets and petals, radiating from the middle, which was usually something like an individual floret from a hydrangea. The outer circle was often a tiny ring of forget-me-nots or sweet alice. I have moved on from floral saucers, but I am sure that this is where the seeds were sewn for my love of pattern and decoration. My first pottery classes in the 70’s, and then Art School in the 80’s did not focus on painterly decoration. It was a Potters’ Society workshop in the late 80’s that introduced me to colour and when Off Centre first started I was almost solely working in the maiolica style, with coloured decoration over a white glaze. 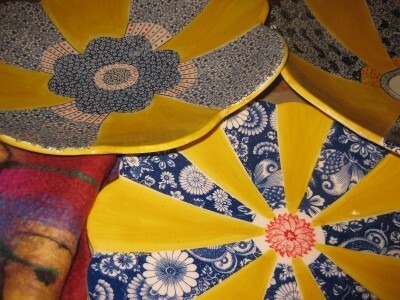 One of my favourite ranges of tableware had mugs, bowls and platters with bold petal imagery dancing across the surface. Now I have moved away from my early patterned maiolica of the 80’s and 90’s, to a variety of modes of decorating. I combine prints with coloured underglazes. I enjoy cutting and assembling the prints as if I was working on a patchwork quilt. Many of these prints are floral, so I can cover my platters with hundreds of petals. My love of felting is an integral part of my art practice. I make scarves using dyed merino fleece, and the bold colours give me a wonderful palette with which to work. The process involves laying out the wool fibres in a methodical, labour-intensive way, spraying with soapy water, and a lot of rubbing, rolling and tossing until the felt fabric is created and shrunk. My felts in this exhibition are inspired by my garden, the colours of Spring, and the beauty of the flowers.